Ranked among the top three in four key classes in Malaysia, the company has grown from strength to strength with 700,000 policyholders today, catering to a diverse customer base from individuals to large MNCS via multi-distribution channels. Its claims philosophy guarantees action within 24 hours and it provides technological solutions in enhancing business efficiency, while providing 24 hour assistance hotlines that also extend to motor, home and travel issues. For corporate clients, MSIG has provided risk management and loss prevention services via its affiliated engineering risk solutions company and infrared thermos inspection services, with over 180 agents worldwide for Marine Cargo. In Malaysia, it has an established branch network in 20 cities towns. Responding to the digital era and its digitally-savvy customers, it developed a first-of-its-kind online platform, “Take It Easy”, and mobile application “Home Assist” to allow customised products for individual lifestyles and to provide home-related claims accessibility respectively. In terms of leadership, MSIG has played a pioneering role in Enterprise Risk Management (ERM) in the region, by improving risk decision-making to drive sustainable performance and establishing structured ERM indicators and committees, which meet regularly to drive ERM initiatives, setting the tone from the top. 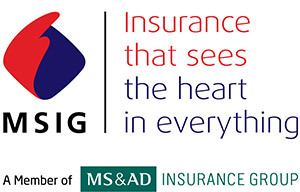 MSIG Malaysia’s CEO, Mr Chua Seck Guan shared “To be a General Insurer of the year is really a fantastic recognition as I recall the criteria set by Asia Insurance Review, the winner must demonstrate leading professional standards and industry leadership in many areas – products, practices, services and responsiveness to partners and end users. I am truly proud to know we are being recognized for meeting those standards”.